Ear Candling treatments at the Navitas Holistic Therapy & Reiki Centre, Shavington, Cheshire, are provided by Katie Bailey MFHT, a qualified Hopi Ear Therapist, Reflexologist and Reiki Master Teacher. Ear candles are hollow tubes made from unbleached cotton or linen and infused with beeswax. We only use Biosun candles as they have safety features and contain only natural ingredients. These ingredients include beeswax, extracts of honey, St Johns Wort, Sage, Chamomile, beta-carotene and organically grown flax. Prior to an Ear Candling treatment, a full consultation will be conducted to ensure that Ear Candling is a suitable treatment for you. You’ll then be asked to lie on a massage couch, on your front or side, while one end of the candle is lit and the other end is placed gently in your ear. You may hear pleasant crackling, popping or feel a fizzing sensation while the candle is burning. The same process will be repeated on your other ear and the treatment is then completed with a calming and soothing lymphatic drainage facial massage. Ear Candling treatments last around 45 minutes to 1 hour. Your first treatment may take slightly longer because of the initial consultation. 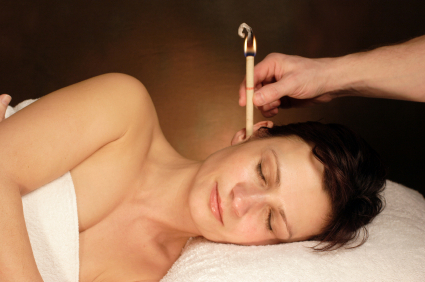 Do you provide mobile Ear Candling treatments? Mobile Ear Candling treatments are also available. Charged at £33.00 for clients within a 10 mile radius. We are also more than happy to travel further afield, so please contact us for prices if you live outside the Crewe and Nantwich area but would still like to benefit from Hopi Ear Therapy.